As a professional designer, you’re often going to need to find faster, easier and more efficient ways to do your day to day job, and here’s where online productivity tools come into play. But there are so many of them that you might find yourself losing precious time only to find out which one works for you. Stick around to find out how you can use Bannersnack to optimize your workflow and create visuals or animations for online content. In very few words, it’s an online design tool built to help you save more time, while doing your best work. Great for banners, animations, responsive & interactive banners, this tool is all about productivity and efficiency, while focusing on helping you get the best possible results. Why use Bannersnack as a Designer, you might wonder? At a first glance, it might seem like just another easy to use, drag and drop design editor made for non-designers; but there’s a bit more to it once you scratch beneath the surface. With an online tool like this, you can find shortcuts that make your life as a designer a whole lot easier. While you might master Photoshop and Illustrator, every once in a while you might need a helping hand with HTML5 content, animations or high volume content generation, and here’s where Bannersnack comes into play. Let’s see what are the main areas where Bannersnack can be a real time-saver and watch some step by step tutorials on how to use the tool to get better results. Animated content is more popular than ever, and with features like the Magic Animator from Bannersnack, creating cool animations for online content doesn’t have to be a time-consuming task for designers. The Magic animator lets you create stunning animations starting from static content, with a single click. Because sometimes you need to create a fast animation, but you don’t have the time to draw and set every transition by hand. Although Bannersnack has hundreds of thousands of built-in assets such as stock photos, fonts, text presets and clipart, it also lets you take your work one step further, because every now and then you might need just a bit of personalization: you can upload any personalized assets you might have to create unique work, faster than ever! One of the coolest features you can use as a designer is creating your own content and then integrate it in banners, visuals or animations. Bannersnack supports vectorial SVG’s so you can import content made in illustrator and apply different animations and transition effects with a single click. You can also import your own fonts if you built personalized ones for the brands you’re working with, and integrate your own photographs or other assets. If you already work as a freelance designer, you might have a hard time with all the Social Media and ads platforms requirements. Staying up to date with all the technical details and changes can be time-consuming, but it doesn’t have to be. In Bannersnack’s editor you’ll always find the Social Media sizes updated and all our templates are built keeping the specifications of each platform in mind. If you just started your career as a freelance designer, you’ll soon find out that staying organized and productive is crucial. Working alone means there’s no one around to motivate you to get things done faster, so you might find yourself losing precious time or working late. If you have been a freelancer for many years, maybe you already have your routine and you’ve given up on searching for solutions to help you get more productive, but every now and then you need to focus on this aspect. Whatever the case, learning new tools always offers a great opportunity to start fresh and stay productive. Here are some of Bannersnack features that can help you get your job done faster and rethink your workflow. Remember the hours you spent resizing and reorganizing the same content for all the ads and Social Media platforms out there? With Bannersnack, you can forget about all that! With the Banner Generator you can create more banner sizes at once! Check out how easy it is, create a free account, and give it a try! As a graphic designer, you might find it hard to convert your content into HTML5 code to make all its elements responsive on a website. Now, you don’t have to learn how to code or lose precious time with this work. You just focus on your productivity! 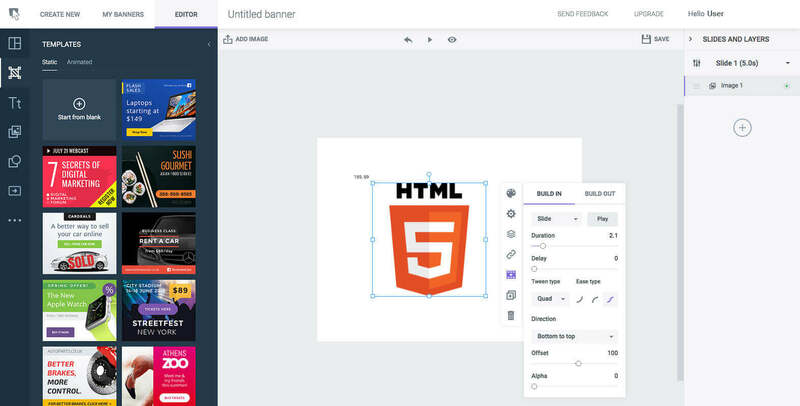 With a single click, Bannersnack transforms your content into HTML5 code that you can embed or upload on your website. Whether you work with a team or as a freelancer, most of the times you are part of a workflow, and a significant part of your time is spent in a back and forth process until your work is approved. With the new collaborative features from Bannersnack, you can optimize that process to get instant feedback, work faster and more efficient. Team members can easily access each other’s creatives and make the necessary changes, thus speeding up the entire team’s design workflow. 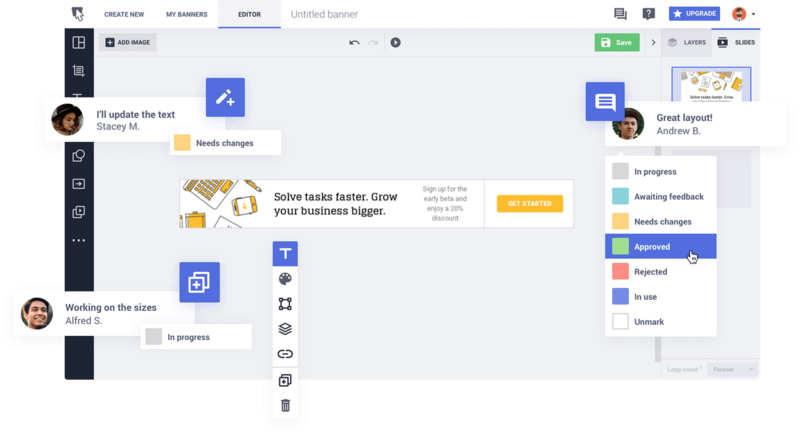 Bannersnack can be a great addition to the tools you already use as a designer, and can help you do your job faster & more efficient, while optimizing your workflow and teamwork. If you liked the features and you think you could benefit from them, give it a try for free and start working faster.